Today's adventure had been scheduled for Smugglers' Notch, but warm temperatures causing rapid snow melting and gloopy footing made us change our plans. 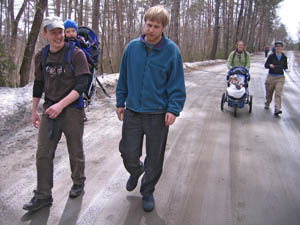 Fourteen folks and young adventurers met at Berlin Pond for a classic mud season stroll/walk/backpack ride. There were snowballs to be touched and squawking birds to listen to. Most of us enjoyed a snack of some kind while on the go. 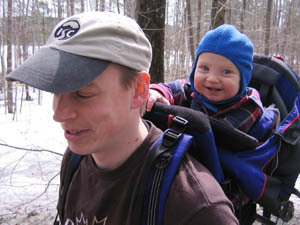 Most of all, we were really glad that it was warm enough that we didn't have to wear the straightjacket snowsuit that makes it impossible to grab daddy's hat, fiddle with its cool label, and drop it on the ground.